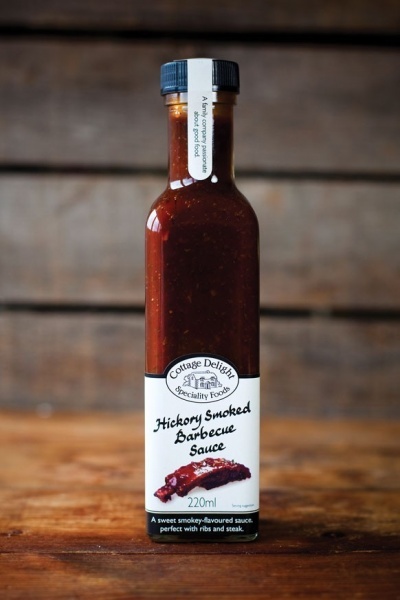 Cottage Delight’s Hickory Smoked Barbecue Sauce is a sweet, smokey flavoured sauce inspired by a classic recipe from the Southern States of America. All Cottage Delight Table Sauces are traditionally made in small batches using only the finest ingredients. Our Hickory Smoked Barbecue Sauce is the perfect accompaniment to any barbecued meats and especially delicious with ribs, steak and sausages. Why not try Hickory Smoked Barbecue Sauce as a dipping sauce for crisps and fresh vegetables or spread onto sandwiches or wraps too. Made in England. INGREDIENTS: Water, Muscovado sugar, Concentrated tomato purée, Honey, Onions, Cornflour, Salt, Sunflower oil, Hickory smoke flavouring, Acidity regulator: Acetic acid, Garlic (contains Vinegar), Dried oregano.